Your wedding outfit is, without doubt, one of the most important elements of your day. But while you may be happy splashing out on the bridal lehenga of your dreams, you may not plan such a generous spend for your white wedding gown, if you decide to wear one for your registry or civil ceremony. That’s why we’ve put together this edit of stunning gowns that have the look and feel of designer without the eye-watering price tag. Whether you plan to take ‘trash the dress’ photos after the event, want to live out your white wedding dress vision, or just want to wear something that makes you feel a million bucks without actually forking out that much, there’s something for every bride. Here are some of our favourite bridal styles to buy now. With a high frilled neck and sweeping blush-hued skirt, this outfit nods to elegant Victoriana glamour. 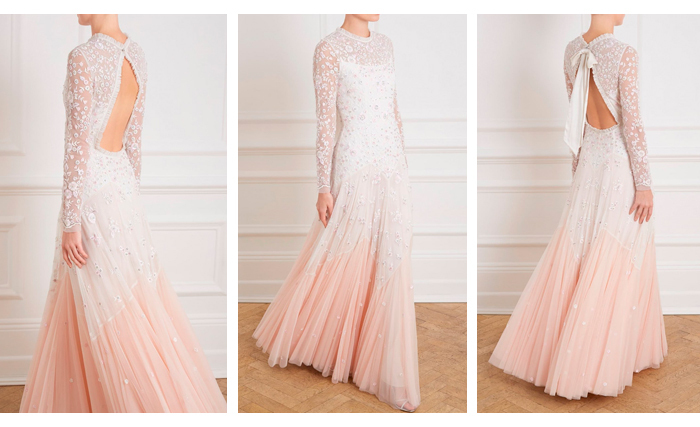 We like the detailed beading, lace and embroidery work over the bodice and skirt. It reminds us of Indian embroidery but reimagined on a Western dress, which as a British Asian bride, gives you the best of both worlds. Available in sizes UK4 to UK16. With a slashed neckline and flattering fit, this pale ivory cocktail dress from Adrianna Papell has a distinctly 50s feel to it. The fit and flare silhouette and below-the-knee hem keep the look feminine while the cinched waist will give you the hourglass shape you’ve always dreamed of. 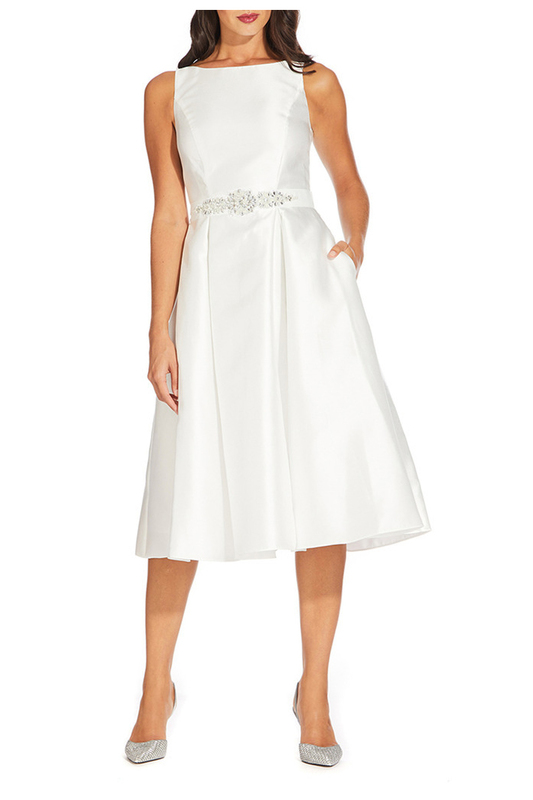 It comes with a grosgrain ribbon belt, embellished with faux pearls and crystals. Plus, pockets! Yes, you read right – you can now pick up a wedding dress at high street favourite H&M. This pretty full-length design comes with what feels like acres of floaty tulle, made from recycled polyester! The deep V neckline is bolstered with a super fine net for extra support. This piece is from the Conscious Exclusive collection, which means it has greener credentials than most. Not keen on the idea of all white or ivory? How about a compromise - this asymmetric number from Ted Baker? 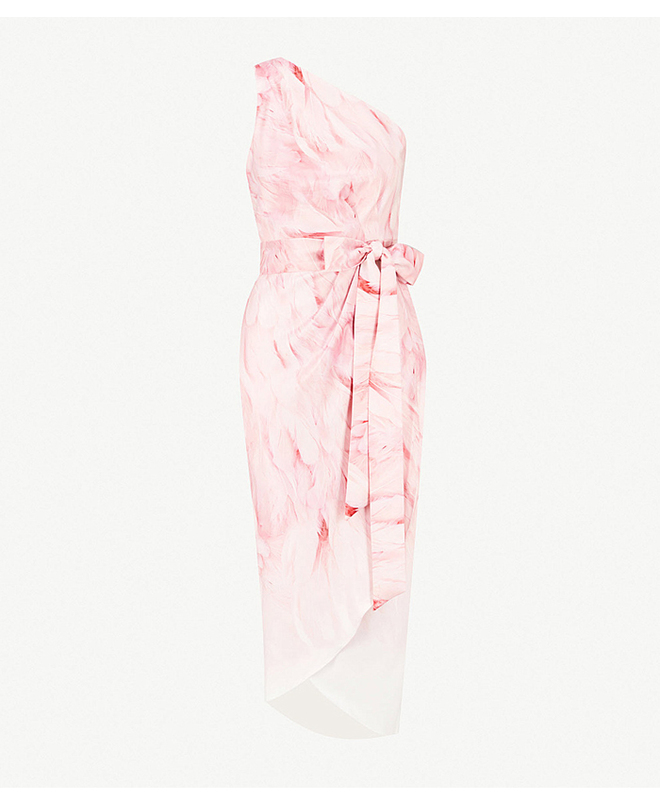 The soft pink ombre with a feather print is ultra flattering on Asian skintones, while the romantic waist tie cinches you in at the waist to define your figure in a flattering way. And unlike many other dresses, this is definitely one that you’ll be able to restyle and wear again for special occasions. 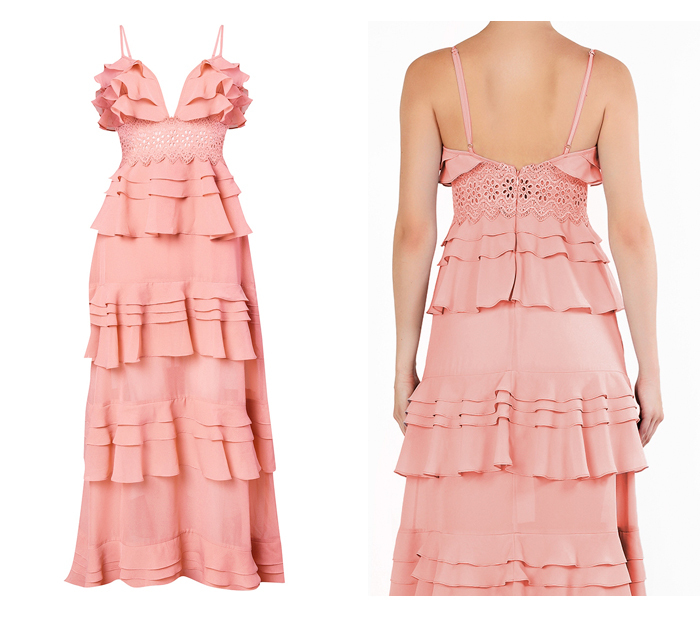 Another romantic pink number, this time from the True Decadence label available at Harvey Nichols. The tiered full-length design features a lace waist, plunging neckline and delicate spaghetti straps. Wear with loose braids and wildflowers in your hair to channel laid-back boho chic. Sizes XS to XXL. How many times has ASOS saved your skin with emergency next-day deliveries? It can also be your wedding gown saviour too, as the online-only label stocks a huge range of formal dresses and bridalwear. The rows of fringing makes this piece look far more expensive than it actually is. 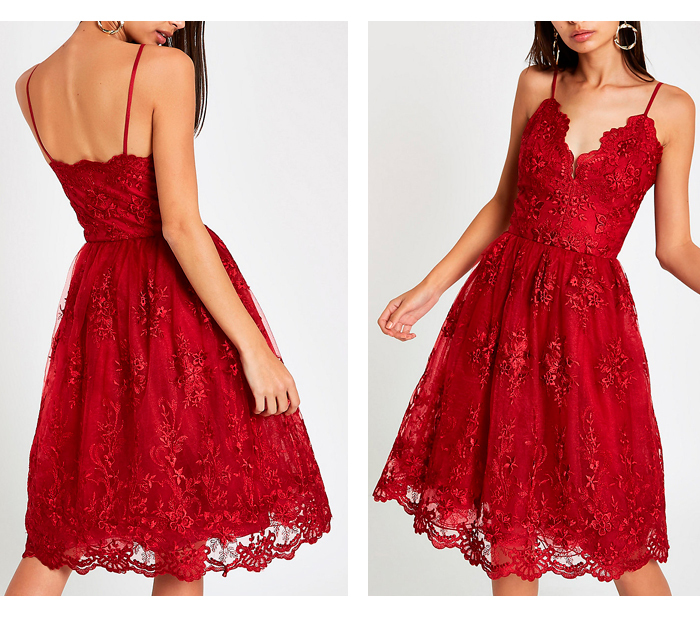 Just as there’s no rule you have to wear red at your traditional wedding, there’s nothing to say you must wear white to your registry. 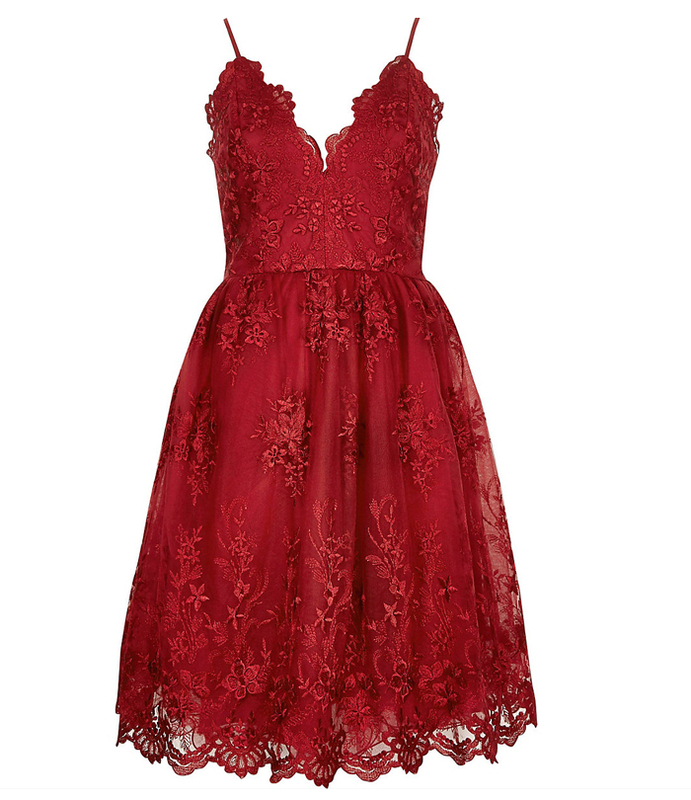 Shake things up with this pretty red lace dress from Chi Chi London. Just match with accessories or your bridal bouquet and you’ll be ready for the ‘I Do’s’. Available in sizes 8 - 16.